Durchmischen, aufgreifen, servieren: Keine Frage, zu einem frischen Salat gehört ein Salatbesteck. Es ist stets zweiteilig, wobei seine flachen, äußerst großzügig gestalteten Laffen die leichte Aufnahme des Salats ermöglichen – und zwar so, dass überschüssiges Dressing vor dem Servieren leicht abtropfen kann. Die langen Stiele des Bestecks sorgen für bequemes Hantieren und verhindern zugleich, dass es in die Salatschlüssel rutscht. Nach jahrelanger Forschungsarbeit ist es WMF 2008 gelungen, Cromargan® weiterzuentwickeln und damit Bestecke extrem widerstandsfähig gegen alle Gebrauchsspuren des Alltags zu machen. Dieses veredelte Material trägt den Namen Cromargan protect®. Die überzeugenden Eigenschaften von Cromargan® werden um eine weitere ergänzt: Cromargan protect® ist neben der ausgezeichneten Säurefestigkeit und Rostbeständigkeit auch extrem kratzfest. Selbst starke Beanspruchung und häufiger Einsatz können dem Material nichts anhaben. So bleibt die Oberfläche von poliertem Besteck aus Cromargan protect® dauerhaft glänzend, und gebürstete Modelle behalten ihre edle Mattierung – beinahe wie am ersten Tag. Schlicht und schlank ist das Besteck Atic, das von Designer Volker Bäurle entworfen wurde. Dabei spiegeln die abgerundeten Kanten und Stielenden den modernen Zeitgeist wider und sorgen für eine angenehme Haptik. Hochwertige Messer mit eingesetzter geschmiedeter Klinge sorgen für langanhaltende Schneidfähigkeit, und die Veredelung mit Cromargan protect® verleiht den polierten Besteckteilen eine hohe Widerstandskraft gegen äußere Einflüsse. Atic zählt zu den universal einsetzbaren Bestecken von WMF, die sich sowohl am alltäglichen Mittagstisch als auch an der feierlich gedeckten Tafel harmonisch ins Umfeld einfügen. Fresh, crispy salad should be served and enjoyed in style. Add a touch of class to your table with one of the many WMF salad servers and enjoy the combination of top design and practical value! Salads are always a true pleasure. While you look forward to fresh lettuce leaves and crispy raw vegetables in summer, you can always enjoy a somewhat heartier type of salad in autumn or winter, such as potato or bean salad. Whether served in individual bowls or as a full salad buffet – with the right salad servers, you add a touch of class and serve salads stylishly and practically.  WMF has a range of models on offer, which are guaranteed to cater to all tastes. The term salad servers is used to refer to the combination of salad forks and salad spoons. They comprise two spoons with extremely long handles, which prevent them from sliding down into large bowls and landing in the dressing. As salads are also sometimes served in small bowls, you can order many of the WMF salad servers in a medium or large size. The spoons have a flat bowl. The salad fork has a long recess in the middle. Excess dressing can drain from the salad through this opening, preventing the salad from "swimming" in it on your plate. With smaller raw salads such as grated carrot or coleslaw, you can also split the salad servers and use them individually for the smaller bowls. With tomato and mozzarella salads, on the other hand, it is a good idea to use the set for removing the slices neatly. You can also use salad servers for other purposes as an addition to serving pieces, for example, for removing pasta or for serving meatballs. 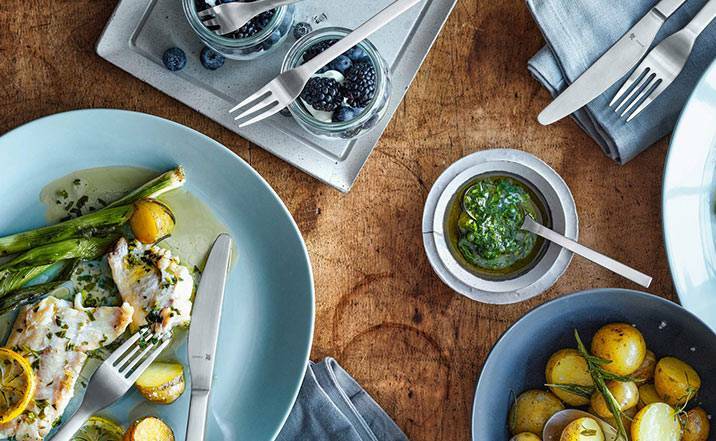 WMF offers a wide range of cutlery collections, from the classic Ausburger Faden pattern to the fashionable and timeless design of the Jette collection. 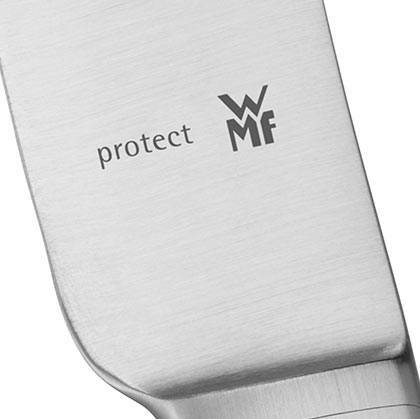 All WMF salad servers are made of high-quality Cromargan®, which is not only extremely robust, but also dishwasher safe. More and more cutlery collections are also available in the Cromargan protect® version, which offers almost complete protection against scratches and therefore promises an exceptionally long service life. You will be enjoying the salad servers from these collections for a very long time. Don't miss out on the opportunity to buy this elegant cutlery. Find suitable salad servers for adorning your table in the WMF online shop now!